With over 1.7 billion monthly active users, Facebook is still the undeniable king of social media. While most small businesses use Facebook to connect with their customers, few scratch the surface of its full capabilities. Facebook is constantly changing and evolving, adding new features and taking away others in an attempt to improve user experience for consumers and businesses alike. However, few small business owners have the time to keep on top of all these updates and miss out on valuable new features. With that in mind, here are 7 Facebook features you should be using for your small business page, and 1 that you shouldn’t! By default the URL of your Facebook page will look something like “https://www.facebook.com/yourbusiness-1419492981399779/”. While there isn’t anything wrong with this, a custom URL like “https://www.facebook.com/yourbusiness” adds an extra level of professionalism to your page. To claim your custom URL, known as a vanity URL, your page will first need at least 25 likes. Once you have the required amount of likes you can visit Facebook.com/username. You will first need to pick a vanity URL for your personal page. Once your personal page is set you are then free to choose the vanity URL for your business page. Note: if you have any links pointing to your Facebook page from your website or listing sites like Google or Yellow Pages, you will need to update them to your new vanity URL. Have you ever noticed a checkmark beside the name of a Facebook page? That signifies that Facebook has verified that the page is run by a representative from that company. Verification checkmarks add credibility to your page and help new visitors identify you as an established and trustworthy brand. Along with the credibility gained from the checkmark you also get a more tangible benefit, increased exposure. Facebook shows verified pages higher in their search results than unverified pages, leading to more people seeing your page! To get your page verified first go to your page settings. Under general settings you will see “Page Verification”. Click “Verify This Page” and then “Get Started”. You will then enter your business phone number, country and language and select “Call Me Now”. Facebook then calls the phone number you entered and give you a 4 digit verification code. Enter that code in the space provided and click “Continue”. Your page is now verified! Note: this feature is only available if your page is set up as a Local Business. In December of 2014 Facebook introduced calls-to-action (CTAs) for business pages. This allows a business to add one of eleven different buttons to the top of their profile. Each of these buttons allows your customer to perform a desired action directly on your Facebook page! You can send Facebook users to your website, get them to sign up for a webinar, watch a video, try out your app and much more. The 11 different CTA’s Facebook currently lets you choose from. 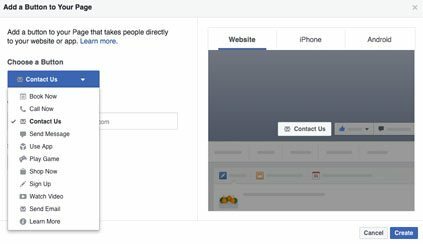 To set up a CTA for your page, first click on “+ Add a Button” which is located just below your header photo on the right hand side. You will then have the option to pick a CTA and preview it on both desktop and mobile devices. When your finished click “Create” on the bottom right of the popup window and you’re done. Your chosen CTA will now appear prominently on your Facebook profile, right below your header image. Your new CTA button will display just below your header image on your profile. Note: If you want to change your CTA simply hover over your existing CTA and select “Edit Button”. In order to be successful on Facebook you will need to regularly publish content. Unfortunately, few small business owners have the time to be constantly updating their social media. This is where post scheduling comes in. Scheduling your posts allows you to set aside some time periodically and plan out your posts. 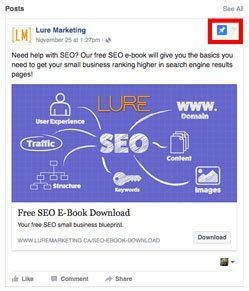 This way you are able to maintain a steady stream of content, without having to stop throughout the day to update your Facebook. To schedule a post simply click the drop down arrow beside “Post”. Here you will be given the option to schedule the post you just wrote. Simply pick the date and time you want Facebook to publish the post and click “Schedule”. You are able to see a list of all of your schedules posts at the top of your page, just above your published posts. The best times of the day to post. The best days of the week to post. What kind of posts get the most engagement. How your page likes have changed over time. The demographics of your followers. How many people have clicked on your CTA. You can then use this information to improve your Facebook marketing efforts. For instance, if you see that posts published after 3pm get more engagement than those posted earlier, you could schedule more posts to be published after 3pm. Or if you see that posts with images get more impressions (views) than other types of posts, you could publish more image posts to increase your reach. 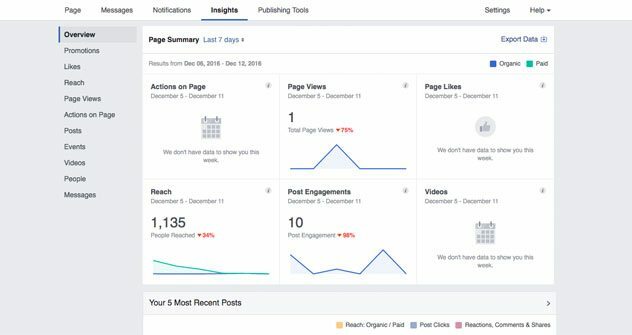 The overview window in Facebook Insights give you a snapshot of how your business performed in the last 7 days. More in-depth information is available by clicking on one of the headings on the left-side menu. A post that has been pinned to the top of a page. Notice the blue pin in the top right corner. One of Facebook’s least used features is the option to pin a post to the top of your page. When you pin a post it will appear at the top of your page, regardless of what else you post in that time. Use your pin to show off your top performing posts. To do this simply look through your Insights and find which of your posts received the most engagement. Pinning posts is also a great way to display a new piece of content, promotion or event that you want to draw people’s attention to. Note: You can only pin one post at any given time. When you want to unpin your post simple click on the drop down arrow beside the blue pin and select “Unpin From Top”. You are then free to pin a different post. If you’ve had a business page on Facebook you have probably noticed that your posts are being seen by less and less people. This dwindling reach is down to Facebook changing the way it ranks new posts in the Newsfeed. With so many pages posting so much content, Facebook has decided to only show what it believes to be the most relevant posts to each user. What this means for you is that you are going to have a very hard time reaching all of your followers without spending some money. This spend comes in the form of either boosted posts or custom advertisements. To boost one of your posts simple click on the “Boost Post” button on the bottom right of the post you wish to boost. You can then set a budget, duration, and the audience you want the post to reach. When you’re done click “Boost” on the bottom right and you’re done. Your boosted post will now appear higher in the Newsfeeds of your selected audience. If you’re interested in learning more about using Facebook to advertise your small business, click here for a more thorough explanation. To be successful with boosted posts you can’t just pick any post. You need to select the right posts to promote. To do this first think about what you want to accomplish by boosting your post. Are you looking for more traffic to your website? To sell more of a product? Get more newsletter sign-ups? Once you have your goal select a post that will help you achieve it. People generally aren’t on Facebook looking to sign up for newsletters or buy products. In order to be successful you will have to show them the value of doing so. For instance, rather than publishing a post with the headline “Sign Up For Our Newsletter” you should instead focus on how signing up for your newsletter is going to help them. A user is much more likely to sign up for a newsletter if they know they will be getting exclusive content or promotions than just by being asked to do so. Hashtags are words that are preceded by the pound (#) sign. They first came into prominence on Twitter as a way to turn regular words into searchable topics. Facebook introduced hashtags in 2013 in an effort to improve their existing search function. Although they are still in use today, the use of hashtags on Facebook never really took off. In 2015 Buffer conducted a major study on the effectiveness of hashtags on the major social media platforms, including Facebook. What it found was that Facebook posts with no hashtags actually outperformed those that included hashtags. The reason for this is that Facebook Search already allows users to search for any word, even those without hashtags. Someone looking for posts about cars can therefore type either “cars” or “#cars” into the search bar. Posts that include “#cars” will only be visible in searches that specifically search for “#cars” and posts with “cars” only visible to searches for “cars”. Given that hashtags were never really popular on Facebook, more users will perform the search without the “#” and the posts without the hashtag will be shown in the results instead. Facebook is one of the best marketing channels available to small businesses. Its size and reach allow you to expose your business to a much wider audience than you otherwise could. Just being on Facebook isn’t enough however. Features like the ones outlined in this article can help you use it to its fullest. 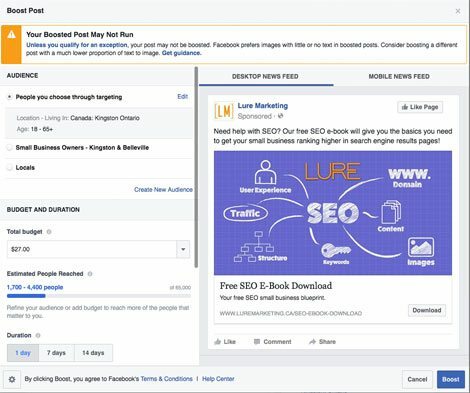 These features are just a few of the many features that Facebook now offers to page managers.